Jurnal Online STMIK STIKOM INDONESIA adalah sistem penerbitan online berbasis Open Journal System yang diterbitkan oleh LPPM STMIK STIKOM INDONESIA. Bahasa Rupa Journal is a journal published by the Institute for Research and Community Service (LPPM) STMIK STIKOM Indonesia, with e-ISSN: 2580-9997 and p-ISSN: 2581-0502. Bahasa Rupa Journal was first published in October 2017 and has a publishing period twice in a year, namely in April and October. Bahasa Rupa Journal has been indexed on : Google Scholar, One Search Indonesia, Portal Garuda, BASE, dan Neliti. The contents of Bahasa Rupa Journal include scientific ontology, epistemology and axiology of Visual Communication Design (DKV) and Multimedia, which includes: (a) visual semiotics, (b) iconography, (c) illustrations, (d) typography, (e) photography, (f) animation, (g) advertising, (h) branding strategy, (i) corporate identity, (j) sign system, (k) logo, (l) printed media, (m) packaging design, (n) film critique, (o) short movie production, (p) cinematography, (q) experimental video, (r) games, (s) the latest applied technologies related to DKV and Multimedia, (t) educational methods in DKV and multimedia teaching, (u) cultural issues related to Visual Communication Design and Multimedia. All articles in Bahasa Rupa Journal will be processed by the editor through the Online Journal System (OJS), and the author can monitor the entire process in the member’s area. The articles published in the Bahasa Rupa Journal, both in hard and soft copy form, are available as open access for educational, research and library purposes, and beyond that purpose, the editorial board of the Bahasa Rupa Journal is not responsible for copyright infringement. SINTECH (Science and Information Technology) Journal is a journal managed and published by the Institute for Research and Community Service (LPPM) STMIK STIKOM Indonesia. SINTECH Journal was first published in April 2018 and has a publishing period twice in a year, namely in April and October. 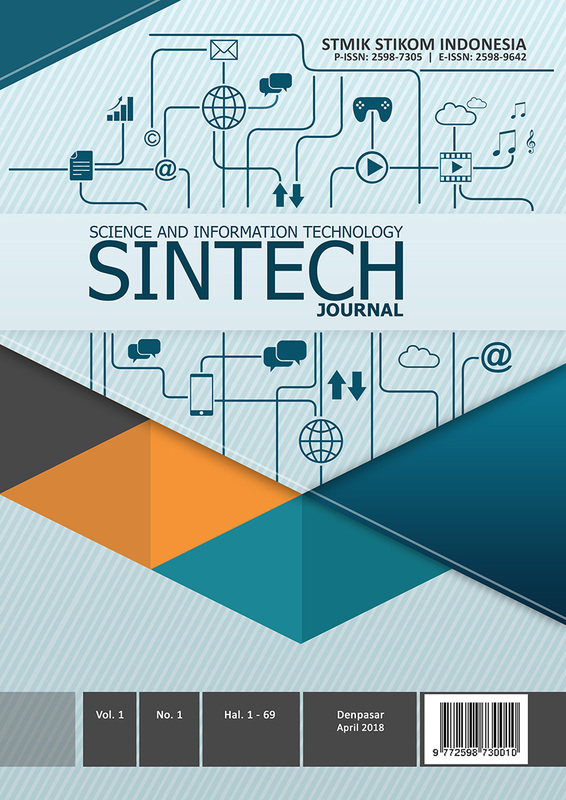 Focus and scope of SINTECH Journal includes: Data analysis, Natural Language Processing, Artificial Intelligence, Neural Networks, Pattern Recognition, Image Processing, Bioinformatics/Biomedical Applications, Biometrical Application, Content-Based Multimedia Retrievals, Augmented Reality, Virtual Reality, Information System, Game Mobile, dan IT Bussiness Incubation. All articles in SINTECH Journal will be processed by the editor through the Online Journal System (OJS), and the author can monitor the entire process in the member area. Articles published in SINTECH Journal, both in hardcopy and soft copy, are available as open access licensed under a Attribution-NonCommercial-ShareAlike 4.0 International (CC BY-NC-SA 4.0) for educational, research and library purposes, and beyond that purpose, the SINTECH Journal editorial board is not responsible for copyright infringement. We invite you to collect articles / papers on SINTECH Journal. The collection of articles in the SINTECH Journal opens year-round and will be published twice a year in April and October. We do Double BLIND REVIEW to maintain quality publications. 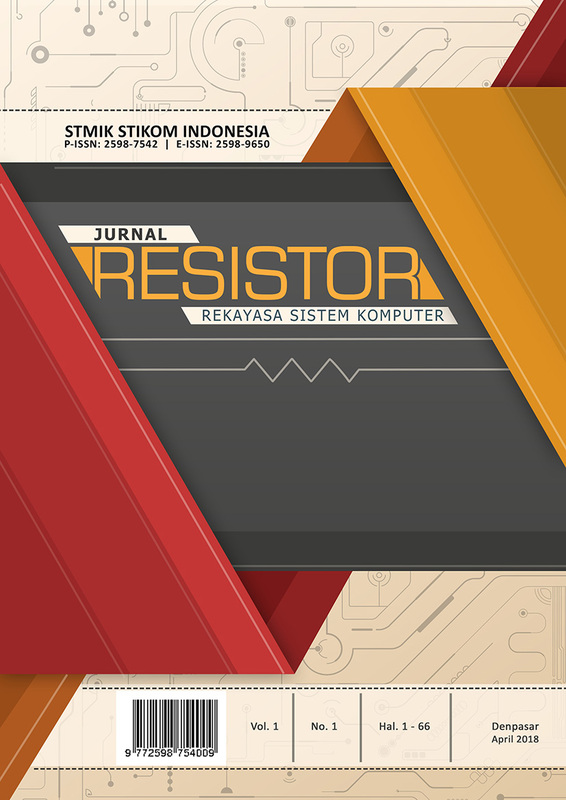 RESISTOR (Rekayasa Sistem Komputer) Journal is a journal published by the Institute for Research and Community Service (LPPM) STMIK STIKOM Indonesia, with e-ISSN 2598-9650 and p-ISSN: 2598-7542. RESISTOR Journal was first published in April 2018 and has a publishing period twice in a year, namely in April and October.RESISTOR Journal has been indexed on : Google Scholar, One Search Indonesia, BASE, dan Neliti. Focus and scope ofRESISTOR Journal includes: Communications, Networking and Broadcasting Power, Energy, and Industry Applications, Signal Processing and Analysis, Computing and Processing, Robotics and Control, Internet of Things, Machine Learning, Network and System Security, Wireless Sensor Network, Mobile Ad-hoc Network, Digital Forensics. All articles in RESISTOR Journal will be processed by the editor through the Online Journal System (OJS), and the author can monitor the entire process in the member’s area. The articles published in theRESISTOR Journal, both in hard and soft copy form, are available as open access for educational, research and library purposes, and beyond that purpose, the editorial board of theRESISTOR Journal is not responsible for copyright infringement. 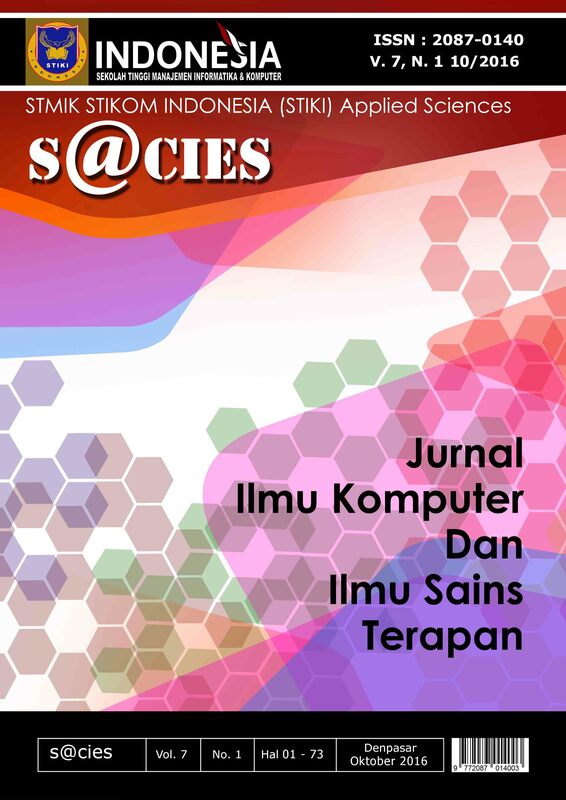 S@CIES adalah jurnal yang diterbitkan oleh Lembaga Penelitian dan Pengabdian Kepada Masyarakat STMIK STIKOM Indonesia yang memuat tentang hasil riset dibidang informatika dan teknologi informasi. Tujuan jurnal ini adalah untuk memublikasikan dan menyebarluaskan tulisan-tulisan dalam bidang informatika dan teknologi informasi yang dapat memberikan kontribusi bagi pengembangan ilmu pengetahuan. SACIES menerima tulisan berbentuk riset kuantitatif maupun kualitatif dari akademisi, praktisi, peneliti, dan mahasiswa yang relevan dengan topik.